There are museums and then there are museums. The one dedicated to Greek Popular Music in Athens’ Plaka district is a good time museum. You feel happy the minute you walk in, and you will dance and sing your way through. You will want to make movies like Anthony Quinn and Melina Mercouri. Greece and music. What a great combination. Music is everywhere here. You can’t walk the streets without it. A beggar makes a day’s nut playing a tape recorder for spare change. Subways, houses, tavernas, offices, stores, everywhere: joyful and unexpected. The tension that builds in the bouzouki music, the striving, demanding rhythms under it, the pastoral, peaceful music of the pipes, the rushing energy of the mountainous violins are all part and parcel of daily life. Often museums stand away from the give and take of the streets, fortresses against weather, time and the trouble and joys of the heart. They require a certain distance between viewer and object. It is one thing to have music in an institution where intellect takes precedent over emotion, and another to hear it under a full moon with dark mountains at your back as you face the darker water, but this simple, small museum skirts or, better, dances around the problem by making music and musicians real and accessible. The casual visitor and serious scholar can sway shoulder to shoulder. You do not need to know the difference between a laghouto or a tambouri to enjoy the place, but if you want know more about, say, a pear shaped lyre with a pellet-ball bow, you’ve come to the right place. It is not just fun to visit, it is one the most important musical collections in Europe. It has special facilities for serious musical scholars, including a 5,000 volume library for people who want to spend more than a couple of hours enjoying music and musicians. The relatively modest three-storied museum is divided into sections that focus on a particular instrument, and the displays involve the senses. You see the instrument and the ingenuity and creativity that went into making it. For example, there is the aforementioned Cretan lyre dating from 1743. Its bow is lined with tiny bells which add a jingling rhythm to the songs played on it. A nearby headphone lets you hear the instrument. The moment you put on the headphone, the museum transform and it and your eyes, ears, toes, heart and brain become one. The number of instruments herein is endless. Bouzouki, mandolins, violins, clarinets, hand organs, flutes, drums, zithers, dulcimers, ouds, and bagpipes, just to name a few. And if this isn’t enough, they have a special section of plain old noise makers. The various odds and ends of life that people shake, bounce, thump and jingle to add music to their lives. Bells, bangers and whackers like shot-glasses that can be slipped over thumb and finger to be used like castanets or coins beaded onto the fronts of blouses to bounce and jingle when the wearer dances. The museum has 167 Greek stringed instruments, the best of which are displayed in a special room for cordophones, a real attraction for readers of STRINGS. It features all sorts of stringed instruments, most of which are known by cognoscenti: Pear shaped fiddles, bouzouki, violiras, laghouto, tambouri, kmanes, mandilinos, not to mention kanoki. The names are different, but the music is the same. The lira and the violin are the only instruments in the museum that are bowed. The violin has only been played in the country for several centuries, with the first recorded usage in 1677. It is now a main stay in folk music, and in villages all over Greece on local celebrations such as name days, weddings, baptisms and church holidays, you can hear the sawing, frantic music and exhausted dancers meet the dawn. The violin is such a ubiquitous instrument that one folk saying rather profanely has it that marriage with out a violin is like a piss without a fart. The lyre is worth a room of its own. It comes in several variations. The most popular is the basic lira or pear shaped fiddle which is played in the lap of the seated player. It is traditionally hewn by the player, the lirasis, custom made, adjusted for the available piece of wood, the length of arms, fingers, trunks and the desired “voice”. The lira is carved out of a single piece of wood, not constructed of staves. The thickness of the walls of the soundbox ranges from approximately 3 mm to as much as a little over 1 cm and they are not necessarily consistent throughout. The museum has many charming examples of the carver’s art. The backs of the soundboxes and the front of the instrument’s heads are decorated with incised geometric patterns and rosettes, carvings in bas relief (anchors, birds, vessels. flowers, birds, animals and human beings). They appeal as much to the eye as the ear. The violira is a little known instrument that was created around 1925. This violin-shaped lira has the figure eight shaped soundbox of the violin. It is no longer made today and is rarely played, but it is the kind of instrument that would attract a musician who does the musical equivalent of learning ancient Greek. The kmanes, bottle shaped lyres, are graceful, primitive instruments with a nice balance. Because they are carved and a little bulky, they seem friendly and eager to please. Violin and lyre bows were made of hair from the tail of a horse which reminds me of a Greek violin-playing friend of mine (about whom I wrote in this magazine) who, when he was a boy, wanted a violin to play so badly, he nailed some violin strings to a board and made a bow from a bent branch and hairs from a village horse. The museum evokes that kind of direct relationship with the nation and the people in it. In another display, I learned that shepherds tuned their flutes with the sheep bells, so there would be a pastoral harmony. What a lovely notion. Yet another display shows a beautiful hand organ that you still see and hear on the streets of Athens. These organs are having a a renaissance since some of the downtown area below Plaka and Plaka itself is closed to cars. 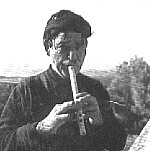 Lambros Liavas, who is also a professor of musicology at The University of Athens directs the museum. He was also greatly involved in the planning of it with other musicologists, architects and designers. Liavas had a great building with an interesting history to work with. It was the home of War of Independence hero and poet, General George Lassanis who was awarded the house by the state for his valor. Built about one hundred and fifty years ago, it is one of the oldest continually occupied houses in Athens. In addition to the stringed instruments and the tape recordings, the museum features great photographs, lithographs and reproductions of old art showing instruments and musicians. There are some prints which trace the origins of some instruments back to the 4th century B.C. For instance, the pandoura, a tricord instrument dates back to antiquity when it was popular, it is said, with centaurs. 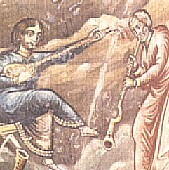 During the Byzantine period, it reappears as thramboura on a 16th century fresco on Mount Athos. 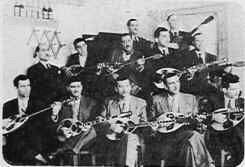 In the 20th century, as the chief instrument of rembetika music, it is back again as the bouzouki. Not only does the institution function as a museum and research facility, it provides lesson and special workshop seminars for children, teaching them the fine old art of constructing music instruments. This alone would make it worth while for a family vacation. The staff wants to attract visitors and make friends. They want to teach children to discover and express harmony, to sing, make music and musical instruments, using materials from their immediate environment, even tins or pumpkins, as their predecessors have done for centuries before them. A small shop sells books and cassettes and CDs. There is also a lovely garden where concerts are performed in the summer. You can get a schedule when you visit. 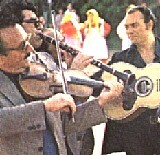 Of special interest for STRINGS readers is Greek Popular Musical Instruments by Fivos Anoyannakis to whom this museum owes so much. This readable history includes such delightful little touches as listing all of the family names that are connected to a particular instrument. Available in English, it has a special section on cordophones. To find this honest museum, walk along Diogenes Street to number 1 in the heart of Plaka, on the North slope, below the Acropolis. It is bustling, active area with a real sense of the past. An Athenian North Beach. Great tavernas are near the museum, and so are other tourist sites such as The Tower of the Winds, with its water clock, sun dial and weather vane, built in the first century B.C., and the Roman Agora. The Plaka is a pleasant, cobblestone walkway with cars banned from most of the area. Away from the tourist shops on the lower levels, narrow streets and stairways wind their way through old homes that are constantly and pleasantly gentrified. You get a real sense of the past, pace and rhythms of life in Athens before the car took over the city. The music seeps from the homes, rolls out into the night air from the tavernas. All around, the music and smells of interesting food beckon, and somehow it is always a full moon. The Acropolis above reminds you of the ancient past, and the buildings around you remind you of the recent past, and the music gives an extra depth to to the experience, so these moments are like heavy water, like compressed time, filled with more feeling, sound, emotion and stimulus than we are used to. The moments seem richer, deeper. 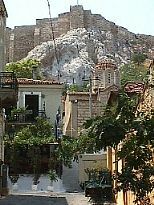 Plaka is perfect for strolling and soaking in Greece, and this small, informative, innovative and entertaining museum is just one more exhilarating treat for lovers of plucked, twanged and bowed strings.